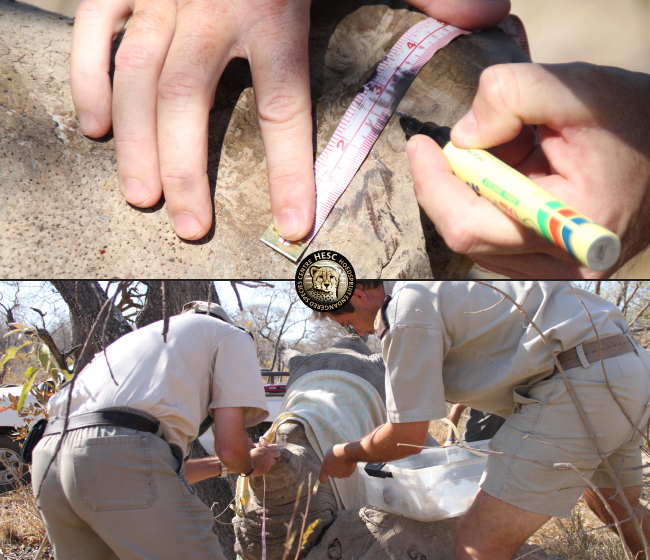 On 30th August the veterinary team arrived at HESC to dehorn Lion’s Den and Dingle Dell. 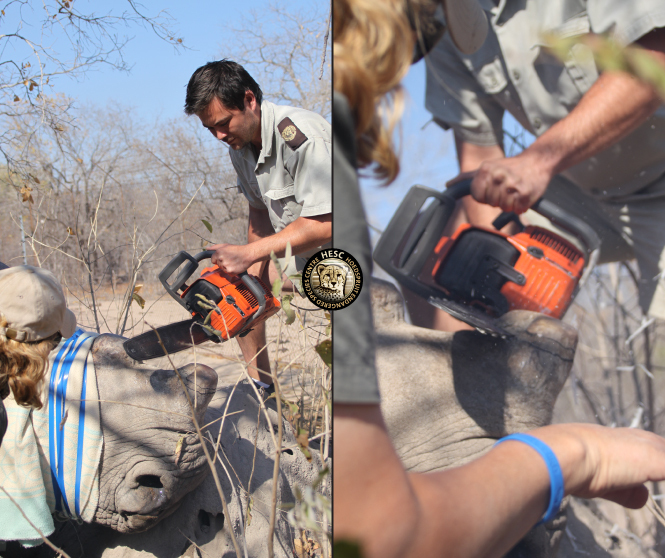 This was not the first time the two rhinos were dehorned, but it was the first time that both had the procedure done on the same day. The standard procedure was followed. 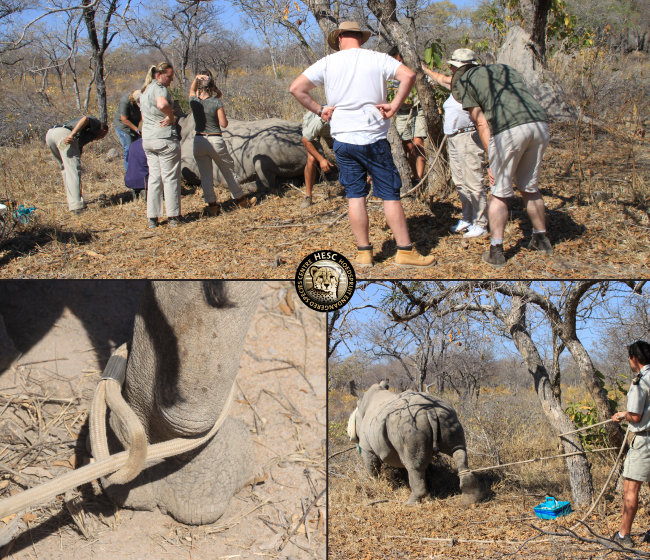 This entails obtaining a permit to de-horn, and arranging that the veterinary team and nature conservation officials are available to carry out and observe the dehorning. 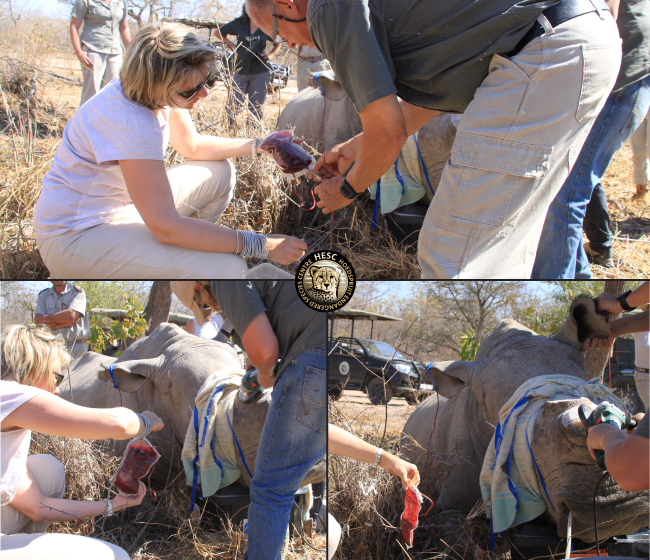 Dr Rogers and Lyle Wiggens (Nature Conservation, Limpopo Province) joined Christo, Adine and Janelle to dart the first rhino, Lion’s Den, for the procedure with M99. It took a while before the anaesthetic took effect on the rhino cow, but she eventually came to a stop on an anthill. We were thrilled that she landed with her head higher up against the mount, as we’d also planned to draw some blood and needed to fill five bags. 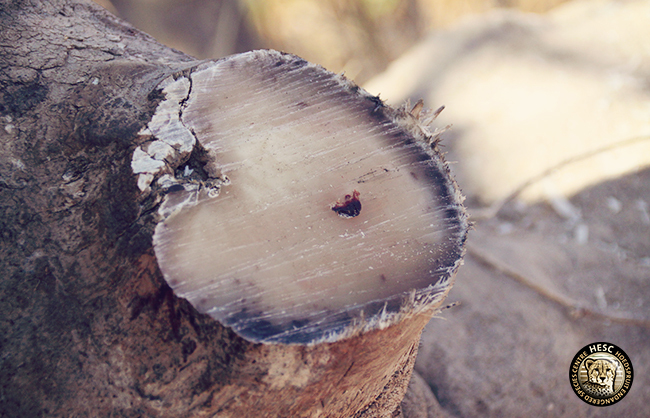 This blood will be used on Nhlanhla (Baby N), one of our baby rhinos. 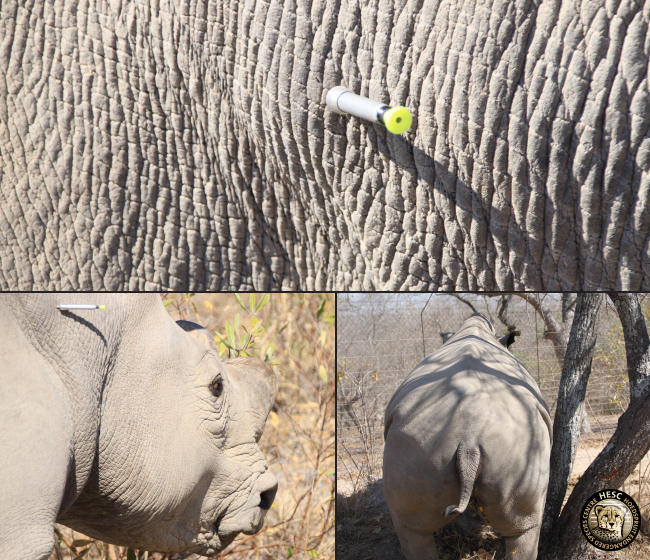 Once Lion’s Den was down, we administered ISEE eye ointment and covered the eyes so they wouldn’t dry out; a drip was attached to her ear; and Lyle proceeded to mark where the horn would be cut off. 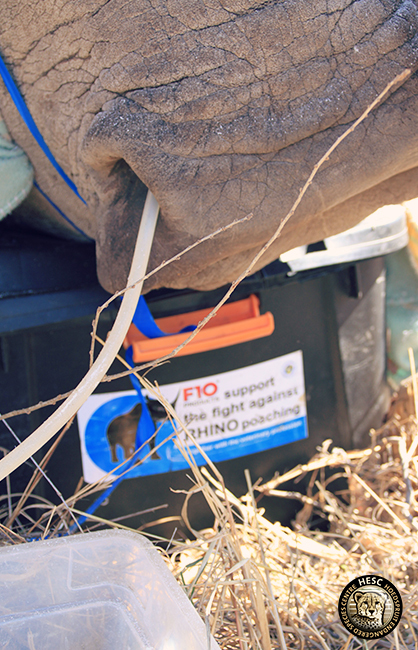 While Christo got the necessary tools for the dehoring ready, Janelle and team connected the oxygen to support the rhino’s breathing. 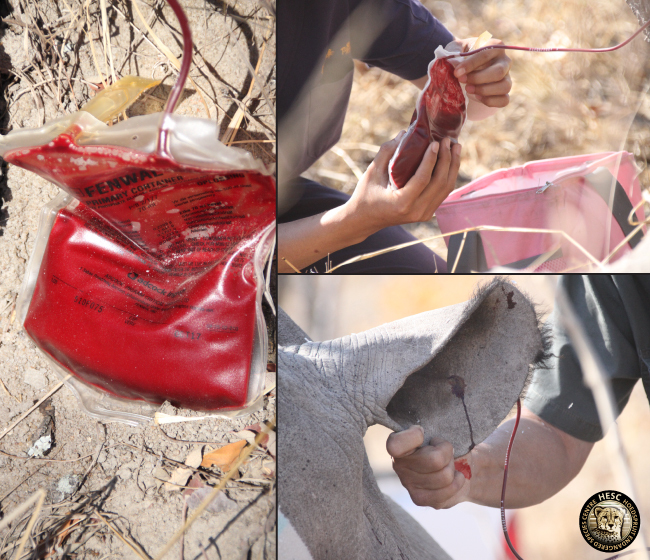 All went well during the de-horning and we managed to fill nearly two bags of blood from Lion’s Den. 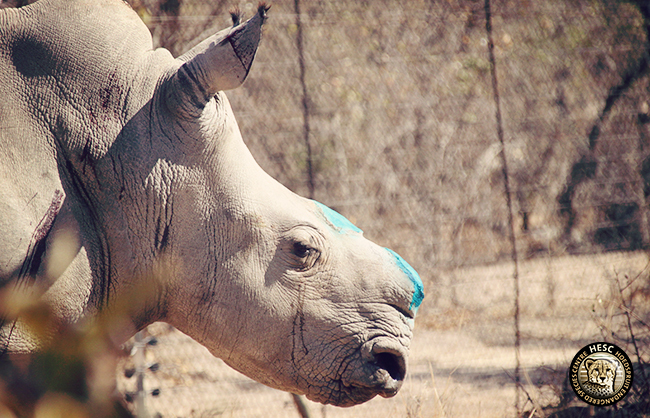 Her horn area was sprayed with Cyclo Spray, an antibiotic for the treatment and prevention of superficial skin infections caused by micro-organisms. Lyle completed the paperwork, but also lent a hand where he could. 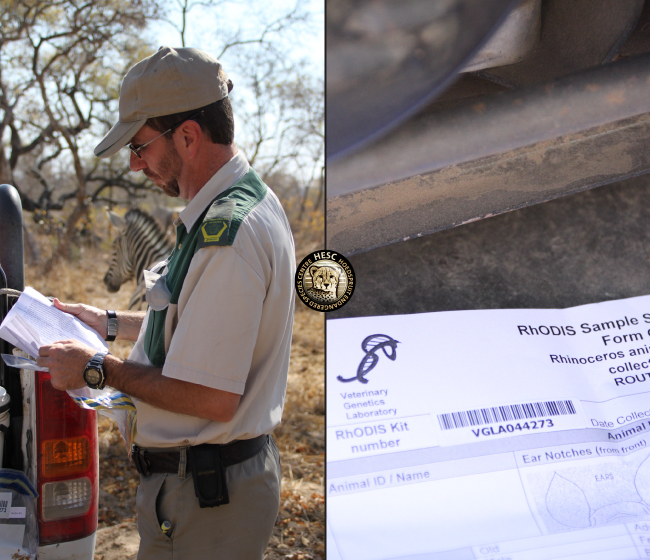 The rhino cow was also given a vaccine against anthrax. 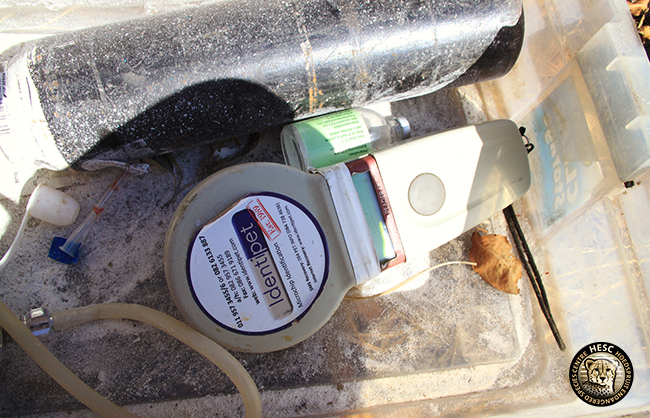 The dry weather conditions that we’ve been experiencing make it easy for anthrax to spread, so we have to take precautionary measures. An antidote was then administered. Fortunately for Lion’s Den she was near a tree, which gave her some support as she gained consciousness and got on her feet. She was soon up and on her way to join Dingle Dell and Philippa. While working on Lion’s Den, Dingle Dell and Philippa were onlookers and had to be chased away a few times. But it was now Dingle Dell’s turn. Dr Rogers moved in closer, and darted Dingle Dell. 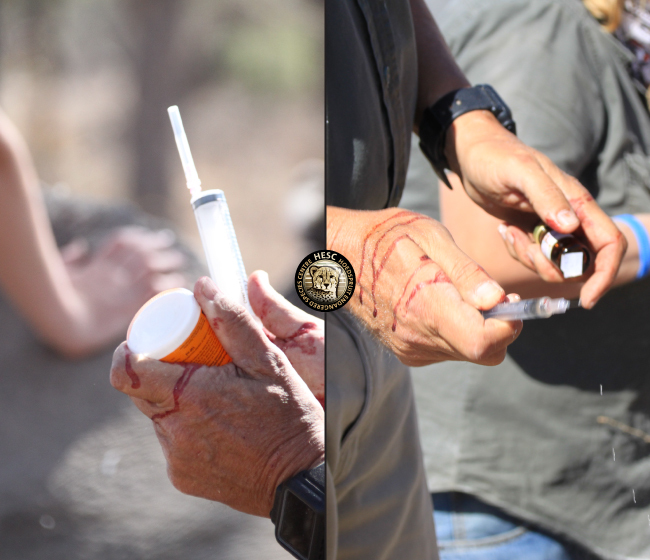 Unlike Lion’s Den, it wasn’t long before the drug took effect on Dingle Dell (having endured nearly 30 sedations over her time with us, it is highly likely that Lion’s Den has developed a greater resilience to the drug). As the drug started working, Dingle Dell got disoriented and bumped into Christo’s vehicle. We had to restrain her from moving towards the fence and bumping into the vehicle again, as her big body could cause a lot of damage. The same process followed with Lion’s Den was observed with Dingle Dell. As she was being dehorned, we were fortunate to draw one full bag of blood from the one ear, and two half bags from the other. This brought to a total of 4 bags the amount we managed to obtain for our young baby in need. All went well during the procedure. As soon as the antidote was administered, she was soon on her feet again and off to join her friends. 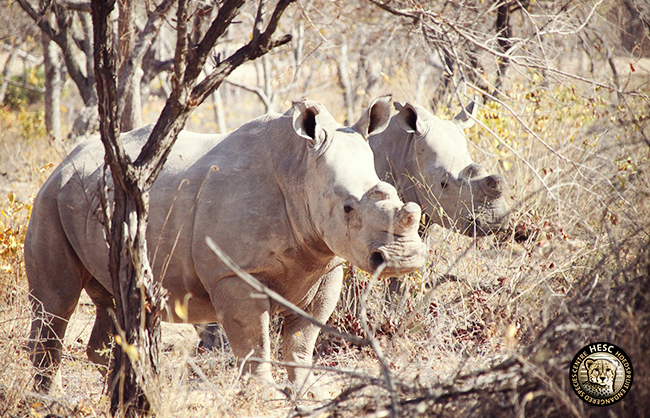 Much safer against would-be poachers. 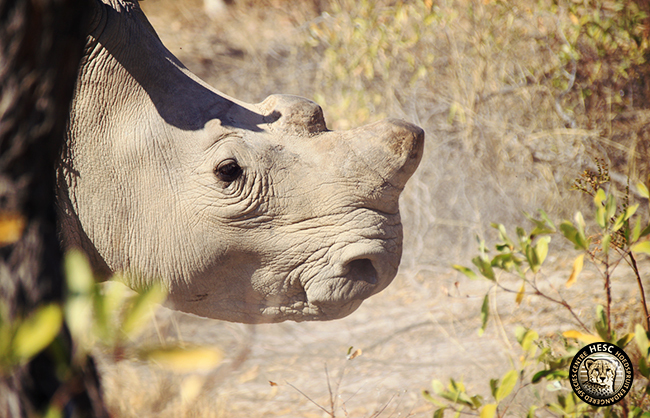 But if it’s the only way to save them life in the wild nature against the criminals poachers, so be it ! This is the hard reality of life in these times. We have evil people who are greedy and cruel. This is the best thing under the conditions we live in to keep these beauties safe.